This store is easily accessed from the A31 (via A349), A350 and the A3049 Dorset Way. From Bournemouth, leave the A3049 at the Fleetsbridge roundabout. Take the 2nd exit past B&Q on your right hand side and Staples on your left. Take the next right behind B&Q and we are the orange building on the left just before the traffic lights. 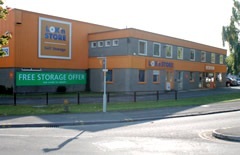 Lok’nStore in Poole has been providing local people with low cost secure self storage since January 2000. This modern facility in Willis Way has over 780 storage units in a variety of sizes to suit any self storage situation whether household, personal or business. This store serves business and household customers from Poole, Blandford, Dorchester, Bournemouth, Ringwood, Christchurch, Swanage, Weymouth, Ferndown, Wareham, Wool, Portland, Wimborne, Bere Regis, Lytchett Minster, Broadstone, West Moors and Dorset. What does storage at Lok'nStore Poole cost? 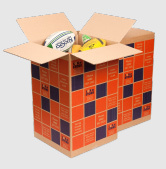 We guarantee that our storage prices are the lowest in the area. We know this because we regularly check our competitors and then set our prices below theirs. 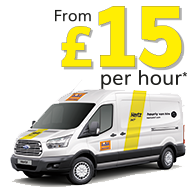 Our storage costs vary depending on the size of space that you need or want to rent, your choice of payment terms and also how long you want or need storage with us. For a rough guide to costs please visit our storage prices page, or for an instant quote please click on the green button to the right. If you would like to discuss our storage services with a member of Lok’nStore’s friendly expert staff at Poole, please call the centre direct on the phone number displayed. Lok’nStore in Poole will not be beaten on price for comparable storage. Go on, call us today! Business storage and office space If you run a business, Lok’nStore Poole can also help you out with low cost office space. We have a range of flexible offices available to suit your business. No long-term commitment - choose weekly, four-weekly or annual terms. No rates or utilities to pay. Free parking. Did you know: Lok’nStore Poole has 40 solar panels on the roof for making its own electricity (when the sun shines that is!) and the yard at Lok’nStore Poole is so big that it once stored the whole of the Bournemouth Railway Station roof!